In 1906, Italian economist Vilfredo Pareto created a mathematical formula to describe the unequal distribution of wealth in his country. Pareto observed that 20 percent of the people owned 80 percent of the nation's wealth. He could not know it, but in time that rule would be found to apply with uncanny accuracy to many situations and be useful in many disciplines, including the study of business productivity. In the late 1940s, Dr. Joseph M. Juran, a product quality guru of that era, attributed the 80/20 rule to Pareto and called it Pareto's principle. Pareto's principle, or Pareto's law, may not have become a household term, but the 80/20 rule is certainly cited to this day to describe economic inequity. It also is a useful tool to help you prioritize and manage the work in your life. Juran took Pareto's principle further, applying the 80/20 rule to quality studies. For example, he theorized that 20 percent of the defects cause 80 percent of the problems in most products. Today, project managers know that 20 percent of the work consumes 80 percent of time and resources. That 20 percent is made up of the first 10 percent and the last 10 percent of the project. There are a nearly unlimited number of examples that we tend to apply the 80/20 rule to in our personal and working lives. Most of the time, we are referencing Pareto's Rule without applying rigorous mathematical analysis to the situation. We generalize about this 80/20 metric, but even with the sloppy math, the ratio is uncannily accurate in our world. There are at least seven ways that the 80/20 rule can be used to enhance your own productivity or that of your business. If you look closely at the items on your “To Do” list, chances are only a few are tied to important issues. 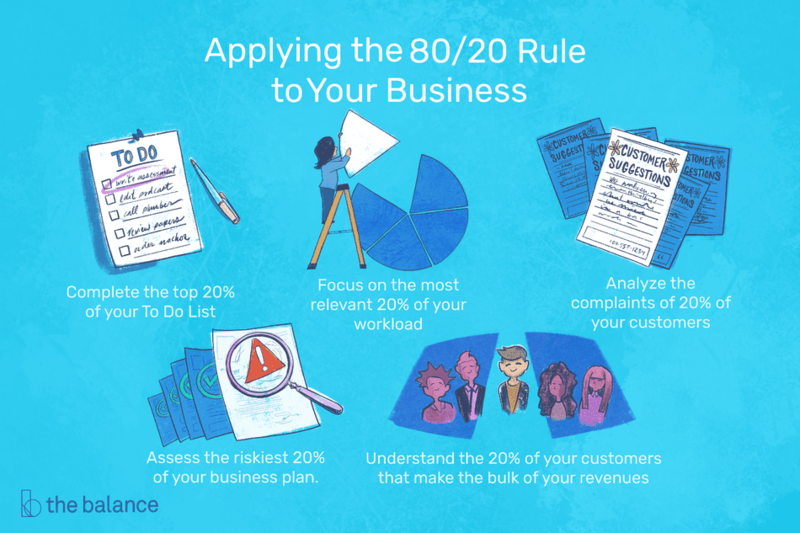 While it may be satisfying to cross off a large number of the smaller issues, the 80/20 rule suggests you focus on the few more important items that will generate the most significant results. The list might not grow much shorter, but you will be practicing effective prioritization. In assessing risks for an upcoming project, you'll find that not every risk carries equal significance. Select the risks that pose the highest potential for damage and focus your monitoring and risk planning activities on them. Don’t ignore the others, just distribute your efforts proportionately. Focus on the 20 percent of your customers that make up the bulk of your revenues and invest your time in understanding, identifying, and qualifying similar customers. Regularly evaluate the ​80 percent of your customers that generate 20 percent of your business and identify opportunities to shed them for customers that drive better results. Some managers and firms actively cull their customer listings every few years, effectively firing the bottom performing customers. Look for the 80/20 rule in your customer service. If 20 percent of your products are creating 80 percent of your complaints, do some root cause analysis to identify the quality issues there. Focus on any documentation issues, and take corrective action as needed. Entrepreneurs and independent professionals can use the 80/20 rule to evaluate their workloads. They might find that a disproportionate amount of their time is spent on trivial activities such as administrative work that can be easily and inexpensively outsourced. When evaluating your mid-year progress on your goals, focus on the few that are most critical to your development or success. As in that task list, not all duties and goals are created equally. The 80/20 rule has many applications in our work and personal lives, but there are minefields here, too. If you're a manager, don't focus on the 20 percent of top performers on your team at the expense of the other 80 percent. You are responsible for increasing the number of top performers, not just assessing and potentially eliminating those who are poor performers. As an investor, you might think the 80/20 rule suggests reducing your investment diversification. ​You might make adjustments to your portfolio if only 20 percent of your investments are driving 80 percent of the results but pay careful attention to your overall portfolio mix. Pareto’s principle is a useful construct when analyzing efforts and outcomes. It is valuable when applied to lists of tasks or goals. It can provide a useful framework for addressing many problems. Use it liberally, but don’t forget that 20 percent of anything is not an insignificant amount.